SETV (Search for Extraterrestrial Visitation) is theory and observation connected with the possibility that extraterrestrial probes may exist within the Solar System. Among the locations considered most promising to search for such probes are Earth orbit, lunar orbit, libration points, and the asteroid belt. Although SETV has a rational basis and is clearly part of the overall quest for extraterrestrial intelligence (whether this intelligence resides within the putative probes themselves or their creators), it has long been sidelined by mainstream SETI researchers. There are two main reasons for this exclusion. First, it has been argued by a number of influential SETI workers, including Frank Drake, that interstellar travel is not realistic and that the most logical way to exchange information across interstellar distances is by radio waves. Second, SETV is regarded by orthodox SETI as being uncomfortably close to ufology (see unidentified flying objects). This is unfortunate because the fundamental ideas behind SETV are as reasonable and amenable to scientific testing as are those of traditional microwave SETI. The concept of "messenger probes," or Bracewell probes as they became known, first arose in 1960, the year in which Drake carried out his Project Ozma. The term SETA (Search for Extraterrestrial Artifacts) was first applied in 1985 by Robert Freitas and Francisco Valdes to describe the attempt to "detect [evidence] in the Solar System by telescopic, radar, infrared, direct probe, or other available means". Freitas and Valdes were specifically interested in the search for intra-Solar System extraterrestrial probes. However, SETA has come to include speculation about hypothetical planetary surface artifacts such as those on the Moon described by Alexey Arkhipov, and on Mars. The newer term SETV tends to be applied more restrictively to searches for probes and appears to have arisen at the same time as a greater emphasis on the design of practical search systems and the beginning of actual search programs. JPL engineer Scot Stride describes SETV even more specifically as a program to search for extraterrestrial interstellar robotic probes by means of "passive autonomous data acquisition platforms" using "commercial off-the-shelf" (COTS) hardware. Other SETV researchers have mounted observational programs to collect data on certain anomalous phenomena. For example, Project Hessdalen, under the direction of engineer Erling Strand of Østfold College has been studying anomalous luminous phenomena in the Hessdalen valley of Norway for over 15 years. A variety of instrumentation has been employed, including photography and related optical and infrared systems, seismographs, radar, HF radio spectrum analyzer, Geiger counter. The team has carried out similar measurements in the Australian desert and at Mexico's Popocatepetl volcano, a well-known focus of anomalous activity. Their work has led to a collaboration with a team of Italian researchers headed by astrophysicist Massimo Teodorani and to two Italian exploratory missions (EMBLA 2000 and 2001), which focused on effects in the VLF and ELF portions of the radio spectrum and on new aspects of the optical phenomenology including low-resolution spectroscopy. At Kingsland Observatory in northwestern Ireland, Eamonn Ansbro and Catherine Overhauser are developing instrumentation that builds on the findings of the Hessdalen and EMBLA research projects. Their surveillance system employs 11 cameras covering the whole sky hemisphere, with sufficient intelligence to recognize and track targets, and to trigger a video tracking system. They have also proposed ULF-VLF radio spectrum coverage, radar, magnetometers, and other instrumentation, as well as a 30 mW, 532 nm laser "for reaction tests on the target". Although SETV remains outside mainstream SETI, it is beginning to be entertained as a viable paradigm, particularly in Europe – for example, through publications and workshops of the European Space Agency. 1. Freitas Jr., Robert A.and Valdes, Francisco. "The Search for Extraterrestrial Artifacts," Acta Astronautica, 12, No. 12, 1027-1034 (1985). Abstract: The rationale for the use of interstellar artifacts by intelligent life in the universe is described. 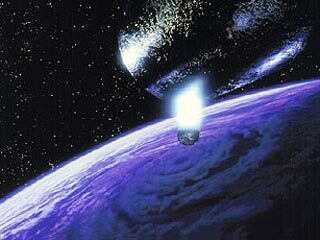 The advantages of using interstellar probes as a means of exploration and communication are presented and shown to be significant enough to counter the time, energy, and technology arguments generally raised against contact via extraterrestrial artifacts. Four classes of artifacts are defined: Those seeking contact, those seeking to avoid contact, those intended to provide a passive technological threshold for detection, and those for which detection is irrelevant. The Search for ExtraTerrestrial Artifacts (SETA) is based on the latter two classes. Under the assumption that an extraterrestrial probe will be interested in life in our solar system, a near-Earth search space is defined. This search space is accessible to us now with ground and satellite observing facilities. The current observational status of SETA is reviewed and contrasted with the achievable detection limits for the different parts of the search space. 2. Freitas, R. A. "The Search for Extraterrestrial Artifacts (SETA)," Journal of the British Interplanetary Society, 36, 501-506 (1983). Abstract: The Artifact Hypothesis states that an advanced extraterrestrial intelligence has undertaken a long-term programme of galactic exploration via the transmission of material artifacts. An attempt to verify this hypothesis experimentally, the search for extraterrestrial artifacts (SETA), is proposed to detect such evidence in the Solar system by telescopic, radar, infrared, direct probe, or other available means. 3. Freitas Jr., Robert A. "Interstellar Probes: A New Approach to SETI Journal of the British Interplanetary Society," 33, 103-109 (1980). Abstract: Interstellar transmissions via energy-markers (photons) or matter-markers (probes) appear to be energetically indistinguishable alternatives for advanced technical societies. Since only Type II and Type III civilizations realistically can afford beacons or starprobe technology, alternative distinguishability criteria suggest the possible superiority of intelligent artifacts for contact and communication missions among extraterrestrial cultures. A balanced, more cost-effective Search for ExtraTerrestrial Intelligence (SETI) strategy is proposed. 4. Freitas, R. A. "The Case for Interstellar Probes," Journal of the British Interplanetary Society, 36, 490-495, 1983. Abstract: Interstellar spacecraft are superior to electromagnetic wave propagation for extrasolar exploration and communication. The search for extraterrestrial intelligence (SETI) should include a search for extraterrestrial probes. Arguments favouring, and various traditional objections to, interstellar communications via messenger probe are critically reviewed. 5. Freitas, R. A., and Valdes, F. "A Search for Natural or Artificial Objects Located at the Earth-Moon Libration Points," Icarus, 42, 442-447 (1980). Abstract: Photographs in the vicinity of the Earth-Moon triangular libration points L4 and L5, and of the solar-synchronized positions in the associated halo orbits (A. A. Kamel, 1969, Ph.D. dissertation, Stanford University), were made during August-September 1979, using the 30-in Cassegrain telescope at Leuschner Observatory, Lafayette, California. An effective 2° square field was covered at each position. No discrete objects, either natural or artificial, were found. The detection limit was about 14th magnitude. The present work extends traditional SETI observations to include the search for interstellar probes. 6. Freitas, R. A., and Valdes, F. "A Search for Objects Near the Earth-Moon Lagrangian Points," Icarus, 53, 453-457 (1983). Abstract: A photographic search of the five Earth-Moon Lagrangian positions included the solar-synchro-nized positions in the stable L4/L5 libration orbits, the potentially stable nonplanar orbits near L1/L2, Earth-Moon L3, and also L2 in the Sun-Earth system. Observations using the 61-cm Burrell Schmidt telescope at the Warner and Swasey Observatory, Kitt Peak Station, spanned 60\'b0 along the lunar orbital plane x 5° around Earth-Moon L5, 48" x 5° around L4, 25° x 13° around L3, 15° x 24° around the Moon (LI/L2). and 14° x 14° around Sun-Earth L2. Limiting magnitude for the detection of libration objects near L3, L4, and L5 was 17-19th magnitude, 10-18th magnitude for L!/L2 plates, and 14-16th magnitude for Sun-Earth L2. No natural or artificial objects were found. An automated search of selected priority plates was attempted using the Faint Object Classification and Analysis System (FOCAS) software package. 7. Freitas, R. A. Jr. "If They Are Here, Where Are They? Observational and Search Considerations," Icarus, 55, 337-343 (1983). Abstract: This paper discusses observational considerations in a search for extraterrestrial intelligence (SETI) program to detect extraterrestrial messenger probes in the solar system. Observable artifacts will most likely be found in a search space consisting of geocentric, selenocentric, Earth-Moon Libration, and Earth-Moon Halo orbits, which may be searched to a limiting artifact size of 110 m (pv = 0.1) using existing or foreseeable instrumentation. 8. Papagiannis, M. D. "Are We Alone or Could They be in the Asteroid Belt?," Quarterly Journal of the Royal Astronomical Society, 19, 277-281 (1978). Abstract: The observations that life has a natural tendency to expand into all available space, that advanced technological civilizations should be able to engage with relative ease in interstellar travelling, and that once this threshold is crossed the complete colonization of the entire Galaxy will be accomplished in a very short interval relative to the age of the Galaxy, lead us to the following dilemma: either the entire Galaxy is teeming with intelligent life and hence our solar system must have been colonized hundreds of millions of years ago, or there are no other inhabitants in our solar system and hence most probably neither any-where else in the Galaxy. Before accepting, however, the bleak verdict that we are all alone in the Galaxy, we must search carefully throughout the solar system for any signs of other technological civilizations. The most logical place to look for them seems to be the asteroid belt because of the many advantages it offers to a galactic society living in space colonies. 9. Steel, Duncan. "SETA and 1991 VG," The Observatory, 115, No. 1125, 78-83 (April 1995). Abstract: A ~ 10-metre object on a heliocentric orbit, now catalogued as 1991 VG, made a close approach to the Earth in 1991 December, and was discovered a month before perigee with the Spacewatch telescope at Kitt Peak. Its very Earth-like orbit and observations of rapid brightness fluctuations argue for it being an artificial body rather than an asteroid. None of the handful of man-made rocket bodies left in heliocentric orbits during the space age have purely gravitational orbits returning to the Earth at that time, and in any case the a priori probability of discovery for 1991 VG was very small, of order one in 100,000 per anmun. In addition, the small perigee distance observed might be interpreted as an indicator of a controlled rather than a random encounter with the Earth, and thus it might be argued that 1991 VG is a candidate as an alien probe observed in the vicinity of our planet. 10. Vallee, J. P., and M. Simard-Normandin. "Observational Search for Polarized Emission from Space Vehicles/Communication Relays Near the Galactic Centre," Astronomy & Astrophysics, 243, 274-276 (1985). 11. Betinis, E. J., "On ETI Alien Probe Flux Density," Journal of the British Interplanetary Society, 31, 217-221, 1978. Abstract: An alien probe diffusion equation and corresponding alien probe flux density are developed to see if earth or the Solar System is being detected by technologically advanced extraterrestrial civilisations. If such is the case, then data in the form of observed probes, anomalous and alien as they may be, may possibly be reconciled with data gathered by earth-based observers. 12. Burke-Ward, Richard, "Possible Existence of Extraterrestrial Technology in the Solar System," Journal of the British Interplanetary Society, 53,, 2-12, 2000. 13. Cornet, Bruce and Stride, Scot L., "Solar System SETI Using Radio Telescope Arrays," Proceedings of SETICon 03, The Third SETI League Technical Symposium, The College of New Jersey, Ewing New Jersey, April 25-27, 2003.